Walleyes are on a serious chew right now in most of the local lakes you fish. Sure, there are lulls in activity and certain days are better than others, but you couldn’t pick a better time to wet a line. An exceeding demand for bait stretches the available supply as most lake systems are just ramping up in biological activity. Baitfish are spawning, but that young-of-the-year flush isn’t of snack-size just yet, so predators lean on what food is currently available in the system. Couple that with the fact that the predator fish’s metabolism is requiring more energy, and you have a recipe for some steady fishing. What goes up, must eventually come down however, and in the coming weeks you’ll see a slow and steady decline in the amount of suicidal walleyes you encounter. Fish will push out of the shallows and emerging weeds to more mid-lake structural elements and the outer edge of weedlines. They’ll also encounter some of the first hatches of the year, and that’s when you’ll be ready to pull spinners. The first major hatch of the year has always been a great time to start pulling spinner rigs, crawler harnesses, or whatever local name you’re used to calling them. Spinners are not exclusive to the bait they carry, but nightcrawlers on the business end of your rigs will reap benefits as mayfly and caddis nymphs burrow out of soft lake bottoms then travel to the surface. 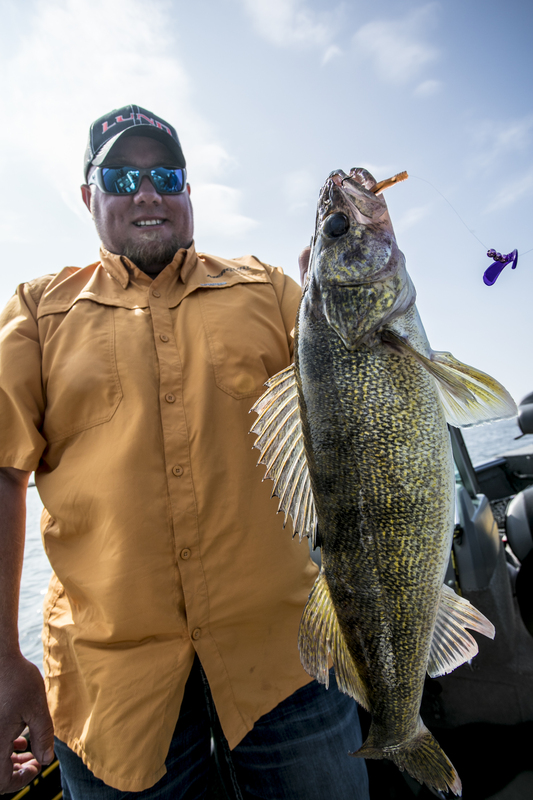 Walleyes eat more bugs than people realize, and spinners featuring a crawler presentation offer an enticing package of vibration, flash, and bug-like meat on the end of the line. Of course, you’re looking for the right fish in the right locations to pull on too. Spinner fishing is typically a moderate speed approach to finding and catching walleyes, so you’re looking for fish that are near bottom, spread out along long breaks and occasionally clustered in pods across structural elements. Usually, your electronics will tell you what speed approach is best. Fish scattered few and far between are often better suited for crankbait fishing, at least until you find them. Fish tightly concentrated in small areas call for slower approaches like slower live-bait rigging or vertical jigging. So often though, we’re faced with a mixture of both, such that the medium speed approach of spinners pulled in the 1.0 – 1.5 mph range doesn’t put all of your eggs in one basket. Given the preponderance of fish so often strewn across a break, and our tendency to find pods of fish as we continue to pull, the problem with traditional spinners has always been that speeds less than 0.8 mph or so, depending on the size and shape of the blade, don’t reliably turn the spinner blades for max attraction. That’s where butterfly blades and smile-style blades come in. Both butterfly and smile blade designs turn at slower speeds allowing anglers the ultimate flexibility in pulling at standard speeds to find and encounter more fish, while dropping down to as slow as 0.25 mph over concentrations of fish you want to really stare at your presentation. You cover two of the 3 major walleye speeds of delivery with a single system, giving you the ability to fine-tune your presentation as you go. Smile blades have been around for some time, and are a bit more bendable, but aren’t as durable or put off as much vibration as the more rigid butterfly designs. Using the right weight style, and appropriate size is paramount to success when fishing spinners of any variety. Most anglers pull these rigs on a wire bottom-bouncer, with a general rule of thumb being one ounce of weight for every 10 feet of water you’re pulling in. Bottom bouncers work great in most situations, but even taller weighted “sticks” are the order of the day for jagged rocks, logs or other extremely irregular bottom. Floats are another addition for many spinner anglers in snaggy conditions, or when fish are elevated a foot or more off bottom. These are typically put in-line on the spinner rig, just in front of the hook, and can make all the difference with active fish. Slow-death style hooks with an irregular bend are another addition we’ve been seeing in recent years. Proven over years on the tournament trail, this hooking method requires a special slow-death style hook, and a nightcrawler threaded all the way up the shank to the hook-eye. The bend in the hooks and rigging of the crawler causes it to spin, and these style hooks are more commonly paired with spinners of all types these days. No matter how you pull a spinner rig, experiment with the various blades, additions, rigging methods, and weight systems covered here for the situation you’re facing on the water. Pairing the right tweaks at the right time will have you prepared to zig when others zag, and have you fishing ahead of the curve.